We're always working to make RepairDesk more flexible, so we have included Google Cloud Print option which allows you too automate printing tasks & along with giving you the option to print jobs via local printers from anywhere from your iPhone or iPad. You can follow the given instructions to use "Google Cloud Print"
1. Open Google Chrome browser and head to Settings. 2. Click on Show Advanced Settings and you will find Google Cloud Print settings there. Alternatively, just enter Cloud Print in settings search bar. 4. The Devices screen will open. Click on Add Printers to sync with Google Cloud Print. 5. Select Printers which you want to sync with Google Cloud Print from the list. 6. 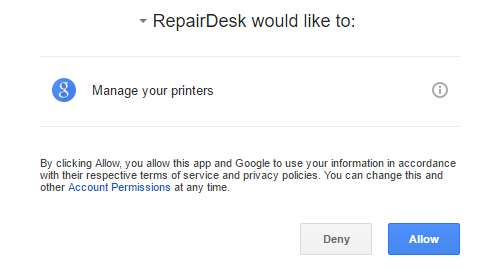 Now login to RepairDesk and go to Settings >> Integrations >> Google Cloud Print. Authorize access to your connected printers. Click on Enable Google Cloud Print. Click on Sync Printers to synchronize your printers with RepairDesk via Google Cloud Print. 7. Allow access in the authorization screen. 8. Click on Sync your Printers on the Google Cloud Print Integration page. It will automatically detect connected printers and will sync them with RepairDesk. 9. Select the printers you want to sync with Google Cloud Print. Click on the Action button to Edit or Delete a printer. To add more printers, click on Add printers from google. 10. Click on Action button and select Edit option to enable or disable triggers. 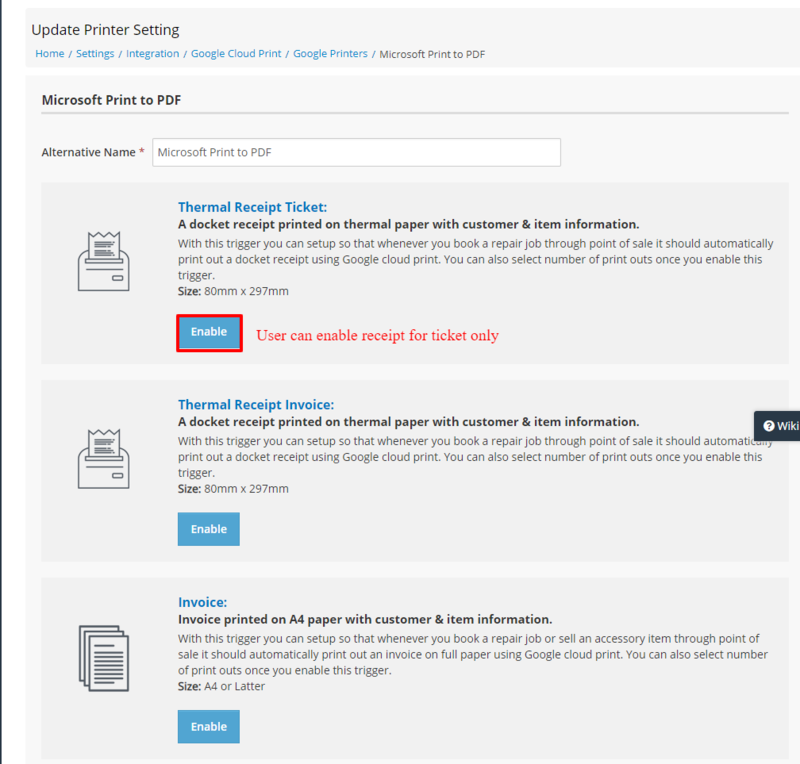 You can also select which kind of receipts or invoices you want the printer to automatically print or not. Once you have made changes, click on Save. Q. Which triggers are available while setting up a printer with Google Cloud Print? A docket receipt printed on thermal paper with customer & item information. With this trigger you can setup so that whenever you book a repair job through point of sale it should automatically print out a docket receipt using Google Cloud Print. You can also select number of print outs once you enable this trigger. Invoice printed on A4 paper with customer & item information. With this trigger you can setup so that whenever you book a repair job or sell an accessory item through point of sale it should automatically print out an invoice on full paper using Google Cloud Print. You can also select number of print outs once you enable this trigger. With this trigger you can setup so that you can print out a receipt with Trade-in information using Google Cloud Print. You can also select number of print outs once you enable this trigger. With this trigger you can setup so that you can print out a receipt with end of day information using Google Cloud Print. You can also select number of print outs once you enable this trigger. With this trigger you can setup so that whenever you book a repair job through point of sale it should automatically print out ticket label using Google Cloud Print. You can also select number of print outs once you enable this trigger. With this trigger you can setup so that you can print out inventory label using Google Cloud Print. You can also select number of print outs once you enable this trigger. With this trigger you can setup so that whenever customer fills out self check-in form a printer should automatically spills out a label using Google Cloud Print. You can also select number of print outs once you enable this trigger. Q. How can I print receipts, labels and invoices? A. To know more about how to print mini receipts, labels or invoices, please click here. Q. How can I customize, receipts, labels and invoices? A. To know more about customizing receipts, labels or invoices, please click here. Q. How Can I Improve print speed? A. To further improve your speed while using Google Cloud Print you need to download and install Google Cloud Print Service client which makes your printing lightening fast. To set up Google Cloud Print Service please follow these steps: 1. Go to Google Cloud Print Service client download link. 2. Click on the "Download Google Cloud Print Service" button to start download. 3. Once the setup file in downloaded, run the installer. 4. To configure your printers, please follow these instructions Note: Please ensure that you have the latest version of Google Chrome running on your system. Google Cloud Print Service client only works for Google Chrome and operating system Windows 7 or above. Q. Which printers work well with Google Cloud Print? A. To see the list of printers which work optimally with Google Cloud Print, please check this link. Q.How can user only enable google cloud print for tickets? A. it very simple, just click on Add printer or select Edit option under already added printer from where you can enable the thermal printing for tickets only.